Today, Hypergrid Business officially launches the Hyperica directory of hypergrid regions, covering more than 200 destinations on 47 different grids. “We’re seeing the beginning of the 3D Web,” said Hypergrid Business editor Maria Korolov. OpenSim, though still considered “alpha” software by core developers, became stable enough for non-mission-critical applications last year. In fact, IBM released the OpenSim-based Lotus Sametime 3D virtual meeting product last summer. A few of the destinations listed in the Hyperica directory. OpenSim is already growing faster than Second Life, and has more public deployments than all other virtual worlds combined, she said. “Obviously, a better platform can come along tomorrow, but right now, OpenSim is the one that’s getting the most traction,” she said. OpenSim is compatible with Second Life viewers, objects and scripts, making it easy for Second Life users to move their communities and content to the new platform. In addition, the OpenSim software is a free download, making it appealing to nonprofits and educational institutions. Professionally hosted OpenSim regions typically cost a tenth of the price of similar regions in Second Life. 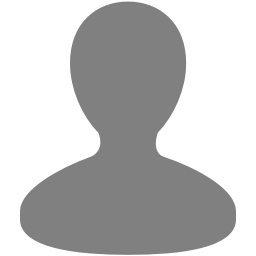 OpenSim is also open source, making it possible for companies to customize the platform to meet their needs, adding modules to connect to corporate employee directories or enterprise databases, for example. A private OpenSim grids also allows the grid owners to decide who has access, and what content they are allowed to have on the grid. That makes the platform appealing to educational institutions looking for PG-rated environments with no age restrictions accessible only by the school community. 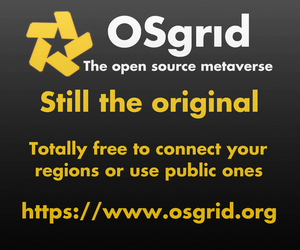 But the single biggest difference between OpenSim and all other virtual worlds is that grid owners can choose to allow teleportation in and out of their grids. Teleportation between grids is made possible by the hypergrid protocol — invented last year by University of California at Irvine professor Crista Lopes — and allows fully-functional teleportation between different OpenSim-based grids. 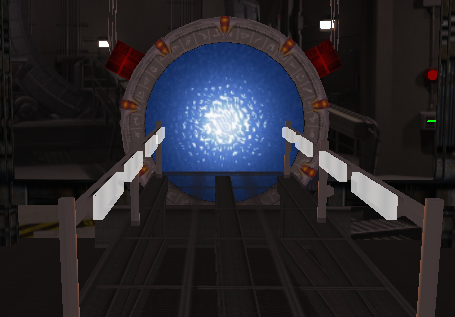 A hypergrid portal on the Logicamp grid. Avatars can travel between different grids by simply typing a hypergrid address instead of a region name into the map search field. Hypergrid teleports allow cross-grid shopping, meetings, virtual tourism, and social events. Items bought on one grid can be carried to another. 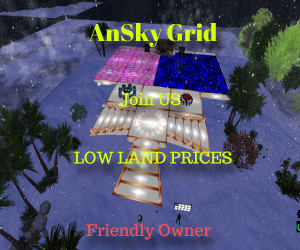 There is even a multi-grid currency that can be used during hypergrid trips. Hypergrid teleports are possible between any grids and regions that are both hypergrid-enabled. Currently, that includes at least 47 different grids, and possibly thousands of other small grids run by schools and enterprises. According to Lopes, more than 1,000 downloads of her “Diva Distro” distribution of OpenSim have been downloaded over the past two months. The Diva Distro is a pre-configured four-region mini-grid that is hypergrid-enabled by default. Meanwhile, the top public OpenSim grids have been growing at over 10 percent a month since last summer, rising 11 percent last month alone. In addition to Hyperica, there are several other websites that are tracking the growth of the 3D Web. They include Metaverse Ink, GridHop, HG URL, The HyperGates, and HyperNodes. Several people contributed to the development of Hyperica. Last summer, OSGrid’s Doctor Rorrim, and Trombly International interns Jeffrey Sheets, Javier González Pardo, Pablo Valcarce Gutierrez, Mathew Klie-Crib worked on an early incarnation of the project. Korolov said she’s also greatful to Hypergrid Business editorial staffers Ankush Chibber and Jie Hu, developer Anastasia Trombly of Greybit who set up one of the Trombly International OpenSim installations, OSGrid’s Tiffany Sicling and her excellent hypergate teleportation scripts, Bri Hasp and Chris Greenwell (“AradTech KoolKam”) for setting up some of the first regions, and Dirk Krause of OpenSim-in-a-Box for the current Hyperica region, soon to be the site of a major international hyperport.